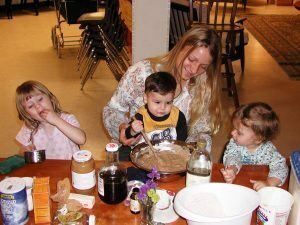 LifeWays North America draws from the indications of Rudolf Steiner/Waldorf education and modern formulations such as The Irreducible Needs of Children by Brazelton and Greenspan, which emphasize nurturing the child’s sense of trust and well-being through having the same caregivers throughout the early years. Relationship-based care that takes family life as its model complements your home life and provides an environment in which your child will flourish. Nurturing Arts—Your child will be nourished with natural foods, hair brushing, calming foot baths, daily outdoor time, and rest for full-day children. Creative Arts—Imaginative play is enriched by story telling, puppet shows, artistic activities, crafts, music and singing. Along with vigorous, healthy play and sensory stimulation, these are the kinds of things that provide the nerve activity needed for higher learning—language development, dexterity, math skills, social skills, and creative thinking—skills that are in very high demand today. According to an article on brain development in a special edition of Newsweek, “ …short of being raised in isolation, a baby will encounter enough stimulation in most households to do the trick – anything from banging pots and pans together to speaking to a sibling. The key phrase here is ‘properly stimulated, which is not the same as expensively stimulated or the worse fate, over stimulated” (Rosenberg and Reibstein, Newsweek, Spring/Summer 1997). A variety of experiential and sensorial opportunities are offered through creative play, household tasks, food preparation, nature exploration, water play, stories, puppetry, artistic expression, drama, music, foreign language (when available), and movement according to age appropriateness. The movement/play portion of the curriculum is a planned and structured component of the early childhood program. It emphasizes child-initiated activities that allow and promote healthy musculoskeletal development by providing opportunities for unstructured, spontaneous movement in a protected environment. Traditional games and finger-plays are also an important part of the movement curriculum as they provide opportunities for the children to imitate healthy movement, develop proprioception and increase both their small and large motor skills. Expanded outdoor exploration – Children need more than the “playground” experience. They need “wild places” as so aptly described in the book The Geography of Childhood by Nabhan and Trimble. Building forts, climbing trees and going on nature walks are valued experiences at LifeWays. The children go outside in all but the most inclement weather in order to help them become more robust and strengthen their bond with the environment in which they live. Plants, gardening, and animal life are part of the outdoor experience wherever possible. Pre-academic skills – The foundation for reading, math and sciences is found in practical life activity and the play of the children, which mimics it. “Studies show that four-, five-, and six-year-olds in heavily ‘academic’ classes tend to become less creative and more anxious—without gaining significant advantages over their peers. Youngsters in well-structured ‘play’-oriented schools develop more positive attitudes toward learning along with better ultimate skill development” (Jane Healy, Ph.D., Your Child’s Growing Mind). Professor Barry Sanders defines “orality” as the rich use of language conveyed through the nursery rhymes, songs, finger plays and circle games that have informed infancy and early childhood life throughout all time. Such a foundation of rich oral language not only helps to assure successful reading, but also helps a child’s ability to develop a sense of self as an antidote to later violent behavior (A is for Ox: Violence, Electronic Media and the Silencing of the Written Word). As children enter the final phase of early childhood, their natural interest in numbers and letters often arises spontaneously, at which time their caregivers encourage their interest and enthusiasm without direct instruction. LifeWays recognizes childhood as a valid and authentic time unto itself and not just a preparation for schooling. Consistent daily/weekly rhythm – A weekly routine is established according to the types of activities taking place (e.g., baking on Tuesday, cleaning on Friday, etc.). The daily rhythm has a balance between very active and quieter activities. Outdoor time is a central focus of every day. Meal times and rest times are the same each day. Consistency, predictability and routine contribute to the child’s healthy development, as well as to a sense of security. Sleep environments will be set up so that each child’s sleep space feels cozy and snug and as “bed-like” as possible. After lunch, clean-up, brushing teeth and washing faces with warm, soft cloths, children will have a quiet story, perhaps a gentle backrub, and a few minutes of quiet singing or music on a kinderharp or quiet instrument. Most children will sleep at least one hour. As they awaken, they each brush their hair and then may play quietly until their suitemates are awake and ready for snack and going outside. An emphasis on human relationships – “Emotional learning comes first, and it happens through interactions. Curriculum comes after you have the warm, encouraging relationships. It’s less effective without them.” – (Dr. T. Berry Brazelton). Emphasis is on loving human interaction with warm speech, live singing, verses, and stories rather than technology. LifeWays Centers are television- and video-free environments except for use in administration and in youth and adult education/entertainment. Recent research out of the University of Chicago reports that only “live” language produces vocabulary- and syntax-boosting effects. “Language has to be used in relation to ongoing events, or it’s just noise. Information embedded in an emotional context seems to stimulate neural circuitry more powerfully than information alone.” Additionally, the American Academy of Pediatrics has put out an official warning that young children should not watch television. Nutritional natural foods program – According to the Children’s Defense Fund’s 1998 Yearbook The State of America’s Children, “myriad studies have shown that children who are afflicted with even mild forms of undernutrition suffer adverse health and learning effects.” These are associated with “impaired cognitive development, fatigue, trouble concentrating in school, and stunted growth.” Our food program strives to provide the best in natural organic foods and involves the children in the food preparation. Ongoing festivals and celebrations honoring the seasons and traditional festivals of the year and the birthdays of each of the children and caregivers. Gardening – The children are involved in planting, tending and harvesting, and youth and/or older adults are encouraged to help whenever possible. Pre-School/Kindergarten program – Activities for the older child are drawn from practical skills, handwork, arts, music, recitation, speech and language development, pre-science and pre-mathematical skills and nature exploration. The richness of this developmentally-appropriate, play-based approach has been demonstrated in Waldorf preschools and kindergartens throughout the world. Multi-generational opportunities – Programs involve volunteer senior adults in the lives of the children on a regular basis wherever possible. Their interaction with the children will vary. Some may sit and do handwork, tell stories or share a special talent. Others may help to establish the gardens, give music lessons, or do woodworking projects. Foreign language – Whenever possible, community friends who speak a native language other than English are invited to come on a regular basis to play simple games or sing simple songs with the children.